There are many animals that are unbelievably strong in their sensory organs, that tracing them manually is just not possible. Such animals are capable of detecting human activity or movement from yards and yards of distances. To capture and gather information about such animals, there has to be a genius way that could overcome this exceedingly alert animal line. Well, here we are back to the use of trail cameras. Although by just placing the trail camera also it is not possible to track such intelligent animals as they are capable of tracking cameras unless used wisely. There are a few first timers, for whom these trail cameras could be more of an excitement and joy. They would be so enthusiastic about the device, that they actually go and check it physically every day, in spite of viewing its recording from the remote location. If not the first time placement of the trail camera, these frequent exciting trips to re-check them would certainly alert the target wildlife. Thereby, instead of watching the natural aspects, habitat and living styles of this wildlife, you would see what those animals would like to show you, since they are aware of some kind of intrusion. So better be careful and control this temptation to view the best results. Trail camera should be placed at highest levels possible. This is because; trail cameras placed at lower levels would make the animals vigilant. In spite of the fact that these trail cameras are equipped with invisible infrared flash lights, there have been various cases in the pasts, where photos taken by these flashes have been realized to be unnatural, meaning the animal knew about the exact placement of the camera. This would render the use of trail cameras as waste. That is why the highest possible location, from where flash is not recognized would get the best shot for you. Often it has been observed that various photographs clicked out of a few cheaper variants of trail cameras have captured only the trail of the animals, especially deer. This is because their sensors are slow enough to detect an animal movement missing a few initial crucial seconds. By the time they detect, the animal is gone, hence clicking just the trail. In such scenarios, there could be just one way of placing the cameras at an angle such that they click the head even after a few seconds are lost. There have been observations in the past about wild animals that travel to the food area only after it is dark. This is because, in the daytime they spend their time or rest where they get comfortable bedding and when it is dark they feel safe enough to come out and search for food. If we could create some comfortable and safer bedding zone near the possible food area, it is possible to track these animals in the daytime as well. People generally play the food trap to bring out animals for tracking. But there are older animals, which prefer going for food in a place far away with minimal human intrusion and abundance of nutritious food. Such animals do not go for food where they could sense even a slight human intrusion. To track such animals, you have to strive and find their sweet spots but with minimum human intrusion and try and place cameras in such locations. Unless you have a huge amount of money to be able to spend on multiple trail cameras, you will have to periodically move the location of your cameras. This would ensure giving you a more holistic view of the forest and animal activity. 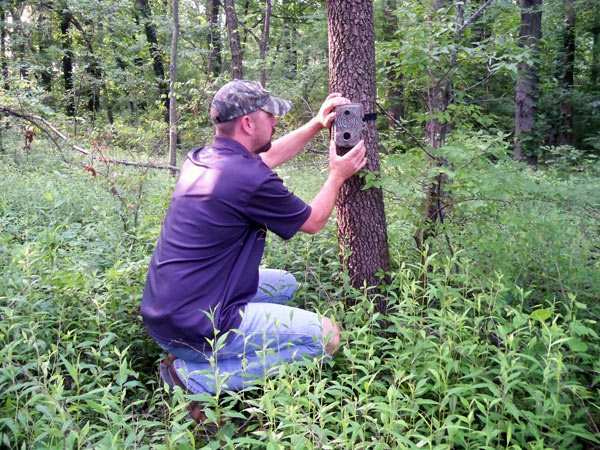 Stealing of trail cameras have always been a biggest threat to the camera owners. Trail cameras are always an expensive affair. The best you could do is to place a trespassing board that could if not all, at least stop a few possible thieves from stealing your precious resource of trail cameras. There are many more tips on how to use the trail cameras for maximum benefits, out of which few are specific to the location and your purpose of using them. The ones listed above could be used in general for all uses of trail cameras.